BCAC President, Tracy Barnswell, wishing her sisters Happy Sisterhood Month! 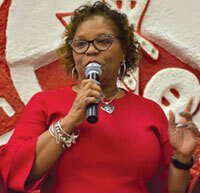 Delta Sigma Theta Sorority Inc. kicked off its annual National Sisterhood Month on March 1, 2018. The women of the Broward County Alumnae Chapter (BCAC) have crafted a week long series of (Delta Week) activities to increase awareness regarding the chapter’s public service initiatives and how they specifically impact the community. BCAC develops and implements amazing programs to support the members of this community. During Delta Week we wish to enhance community involvement in the many programs that we offer. Our goal is to deepen the community’s understanding of our public service initiatives and programs, which are in partnership with Delta Education and Life Development Foundation, Inc (DELDF). ‘This effort will continue to brand our organizations as service leaders in Broward County”, says Tracy Barnswell, BCAC President and Marilyn Jones, DELDF Chair. All Delta Week activities are open to the public. Majority of the events will be held at The Kathleen C. Wright Life Development Center (Delta House) in Osswald Park located at 2150 N.W. 21 Ave., Fort Lauderdale, Fla., 33311. During this week we plan to provide service, insight, fellowship and fun to our community. Members of the community are not only welcomed, but, encouraged to attend the below events and to bring a friend. You can win $1,000, an Apple Watch or a $300 gas card with the DELDF raffle. Tickets can be purchased for $5 at any of the Delta Week activities. Saturday, March 24, 4 p.m. Big Hats and Bow Ties (Grand Oaks Golf Club). For more information about Delta Week activities, visit the BCAC website at www.bcacdst.org or our Facebook page by searching “Broward County Alumnae Chapter, Delta Sigma Theta”.